The past year was really eventful in this industry, we saw a lot brokers coming and going, we witnessed regulation to finally being imposed and finally we saw the best binary options brokers shaping. Let’s start with regulation. Most of the brokers are based on Cyprus where they have to get the CySec license. The new law was voted almost two years ago, but only last year the companies that offer binary options started to get regulated. And some really odd things happened. For example iOption closed their doors at the time they were in the process of getting their license. And Cedar Finance saw their license removed only one month after getting it. Other brokers preferred to quit Cyprus to avoid regulation, like Zoomtrader for example. But even that did not avoid them being fined by the CySec for unauthorized operation. Some brokers moved quickly and silently to locations that do not require them to be regulated. But these are all stories that are not about the best binary options brokers. Because those who take it seriously are getting regulated and licensed everywhere they can. Take TopOption as an example. It is really one of the leading brokers in terms of regulation, they have licenses in a lot of EU countries. Others are following. The best thing for us traders is that unlike a year ago, we now can safely choose a broker that is regulated. Now there are many companies that have that and we can choose among them based on other criteria like the minimum deposit or minimum trade. Speaking of that, Topoption is leading in this area too. Their minimum deposit is only $100 and minimum trade $5. Others ask for $200 or more. But maybe you want a wider variety of binary options. In this case you might want to check 24option, because their offer is really big, probably the biggest in this industry. Things become a little bit more difficult when it comes to traders from the United States. Because not a lot of brokers are accepting them, at this time we can recommend only one in our list of top binary options brokers, and it is Stockpair. It is a very serious company with a great reputation, so if you are from the USA, we really recommend them. When we talk about binary options brokers, we of course are aiming for the best reliability, withdrawals being always the main concern. 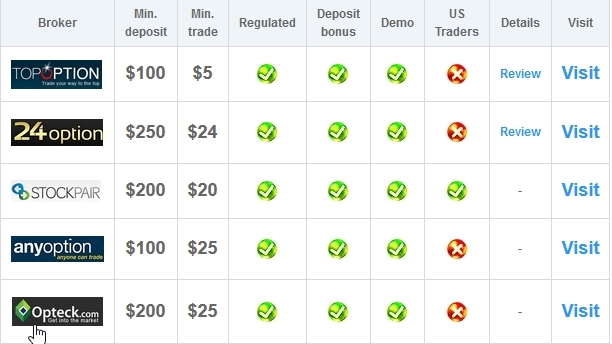 Brokers in our list have been tested and verified, they pay their traders. To finish this recap for 2014, we would like to mention one broker as a proof that regulation does not mean everything. It is Banc de Binary. They are regulated and everything seems normal from this point of view. But we have had several traders telling us that is really difficult to withdraw money from their accounts with this broker. So we really cannot recommend them. But this the main purpose of our list of the best binary options brokers. We recommend only those who are regulated, reliable and proven by feedback from other traders. Hi, just search for mobile plugins for your CMS (WordPress, Joomla etc.). They are easy to install and run. Does anybody know a reliable signals service that uses any of the top 5 brokers? Thanks for sharing your thoughts on the best binnary options brokers. Thanks very much for the information on Brokers, it is very helpful for me as a new person looking to start trading.